A golf travel bag will protect your clubs during transit. If you're traveling with golf clubs, you'll need a a good travel bag, especially if you're going by airplane. Safety regulations require that travelers check their clubs, rather than carrying them onboard. 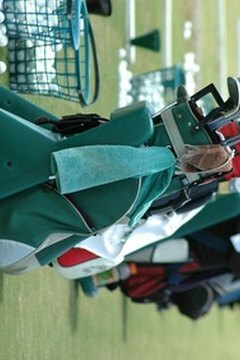 There are three types of golf bag: soft-sided, hard-sided and hybrid. The type you choose depends on the type of travel in which you'll be engaging. Check the travel bag size carefully. You want to be certain that it is larger than the full height of your golf bag when standing with the clubs emerging from the top. Measure your clubs' full height when in the bag and compare it to the interior height of the travel bag to ensure that there's enough clearance to stow your gear. Get a hard-sided bag if you don't have space restrictions and need to protect your clubs while they're being shipped or if you travel by air extensively. Hard-sided bags are ideal protection against the rough ministrations of many airport baggage handlers. However, they're rigidity also makes them less able to fit easily into the trunk of many cars. Buy a soft-sided bag to provide good protection with more flexibility. Soft-sided bags are not as strong a defense against airline baggage systems, but most clubs will fare just fine, especially as these bags are typically larger and your clubs will be encased in your golf bag as well as the travel bag. These types of bags also provide plenty of storage space and outside pockets, making it easier to minimize your luggage. Consider a hybrid if space is severely restricted. This type of bag offers the least amount of protection, as it's basically your golf bag with a hard-sided top. With a hybrid, you don't pack your golf bag, you simply pack your clubs and the equipment you normally carry in a bag. It's ideal for those traveling frequently by train or car, but it's very inconvenient for airline travel, as you need to unpack and re-pack your golf bag each time you use it. Furthermore, unless there's a golf bag at your destination, you need to get your golf bag to your destination as well, which is fine for those who can toss it in the trunk or on the train, but it doesn't make sense for airline travelers. Narrow the list of options. Rule out any without wheels if you travel frequently by air or train; you need the wheels to help maneuver the gear around the station or airport. If you can, try the handle and see how it feels in your hand when dragging the bag around. Ergonomic or rubberized handles make for the most comfortable journey. Rule out any bags that don't have a handle at all. Search online (see Resources) or at your local sporting goods or pro shop once you've decided which bag to purchase.